Tracking a learning partnership between students and myself, as a teacher. At one point last year, during a meeting of my school’s leadership team, referred to as a Curriculum Area Leader meeting, I said “Sign me up.” This is the kind of statement I have been known to make when somebody throws out a wild idea that fits my educational philosophy. Implicitly, I attempt to express support for an idea in this manner. Explicitly, I agree to take part. Which is why I now teach in a classroom twice the size of any other at my school, and why that classroom has no doors, separated from our giant hallways, known as coreways, by a partial wall of glass. An open classroom fits my philosophy and approach – come on in! We’re a community. Classrooms are awkwardly small in our building, which was built to encourage breaking out of classrooms into the gigantic hallways. We get the best of both worlds with the new room. We now have a water fountain in my room, which is great. Hydration is life. We get to play with a new generation Smartboard projector. After three years of trying, I get a regular whiteboard to use! Wahoo! The downside is that I keep tapping the whiteboard with my finger when the beamer is on. The pen is an awkward tool thus far. The classroom can become suddenly swamped by noise. For some reason today, the PE teachers were rocking out to AC/DC and the door from the gym to our floor was open. Loud. Two teachers choose to communicate between stairwells – loud. Giggles – loud. It is now totally impossible to do any high quality recording in our classroom for digital journalism purposes. The ambient noise is too unpredictable. The coolest thing about this classroom is that it is a leap toward a more open school. I am always surprised by the reticence of some colleagues to have others enter their classrooms; I understand concerns about interruptions, but have never found this to be an actual problem. My guess is that my classes will grow more and more comfortable with class that isn’t behind walls, less likely to be disturbed by people wandering in and out, and immune to the ambient noises. We’ll see. The coolest thing that happened today, tangentially related to the classroom layout, was that a student asked to sometimes drop by the new Digital Journalism 2 course for help with her writing. We discussed how she could choose to write for some editions of the student newspaper, stopping into the class (which coincides with a free period for most 11th and 12th graders) whenever she wanted feedback from a peer or from me. She was stoked enough by the idea to join in for class today and get a preview of our Basecamp setup for managing the paper. The open classroom sets a tone, reinforced by students opting into some sessions of the course during their free periods. I can’t help but think this sends a cool message to the kids who are enrolled – others want to be here, too! Certainly, this is a bit of an experiment at school, and I’m honored to be leading the charge. Another colleague teaches two courses in the space, while I teach a full load of five courses there. I will regularly reflect on our experiences as they accumulate. Today was interesting with our iPads in Digital Journalism. Students are working on a first podcast based on a short current event article written last week. I provided links to tutorials on two ways of making a podcast – one in Garage Band and one in Aviary on their laptops. Most students dove in, playing with different options and experiencing some real frustration with inflexibilities in Garage Band. However, many swiftly figured out ways to make Garage Band work or found other apps for recording voice and sound. Two students spent almost the entire period searching the App Store for paid apps that would “make the podcast,” as they described it. They ignored the tutorials even after redirection and lost an hour looking for simple solutions for sale. Is this the design of the iPad and App Store? 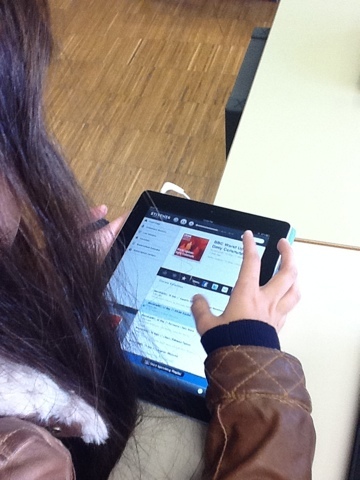 Another student found the Stitcher Smart Radio app and explored podcasts, listening to several. She reported that she “just listened to a lot of podcasts to know how it should be.” This is an example of using models to learn and playing to the strength of the iPad – media consumption. A number of students in the class are almost finished with this podcast project and stand ready to help their peers along toward completion themselves. Already, kids have gravitated toward one another based on percieved strengths and natural cooperative learning seems to be taking place, although for one student who dislikes and is uncomfortable with technology, I’m concerned he’s taking a backseat and not learning hard skills of media creation as a result. We spoke about how they are working together today and this is something I will keep an eye on going forward. Finally, it was interesting to hear how students are developing strategies for the podcast, some working solely on the iPad or fluently on the device, as some might say. Others are offloading to their laptops or Macs at home in order to create the product. They will submit their podcasts by uploading them to their Posterous blogs (or Spaces, as they have recently been rebranded). I have an open mind right now about which way is best and figure the proof will be in the pudding! Faculty, staff, or students may not transmit or seek access to materials which violate laws, infringe on copyrights, or have threatening, obscene, or racist content unless in the context of investigative research. This change made sense in a journalism classroom. I applaud the young woman who pointed it out and re-wrote it. The next changes were necessary to navigate the tricky nature of a 1 to 1 iPad setup, because kids can authorize the iPad on their own iTunes account and put a lot of money in apps, music, and other media into the iPad, only to give it up in the spring. Of course, de-authorizing the iPad should mean they lose nothing from this activity, but we also wanted to circumvent students begging for apps from parents that are “necessary” for school. If they pitch the idea to the class, we can get paid apps, but they don’t need to be buying them on their own. The user accepts responsibility for all software on the machine. The user agrees not to alter the core configuration of the iPad, but may install additional software or apps without approval by the ZIS IT Department. However, any apps purchased by the student for use with their iTunes account are their own responsibility, must adhere to previously stated policies of responsible, acceptable use, and will not be reimbursed by ZIS for any reason. The user accepts responsibility for the physical security of the iPad. The machine is not insured under the school’s insurance policies and will not be replaced irregardless of accidental or purposeful damage or destruction. Additionally, if a user is deemed negligent they may be held responsible for replacement of the iPad, such as the iPad being left unattended and in view in a car or unattended in a public place, in which case the user will be held personally liable for any loss or theft. We provided students with big, burly cover for their iPads and wished them well. In order to take their 1 to 1 iPad, students returned the cooperatively modified RUP with signatures from themselves and their parents, as well as with an action research informed consent letter that I’m happy to share if anyone is interested (just comment). This week, we are off and running, students are keeping reflective notes in shared Google docs as we go, and I’m excited to see what happens next. Today we put iPads in the hands of the students, and it was pretty fascinating to watch. Immediately, students began following their interests and trying to shape the platform to fit their needs. One student signed up his student email account, got a Google app for Docs, Mail, and Reader all lined up first thing. Another set of kids set up Facetime unsuccessfully, switched to student emails, and threw on Dropbox between hilarity with Photo Booth and video. Another kid read several articles on The New York Times and then grabbed the app once he worked out how to navigate the App Store. Yet another interviewed a fellow classmate for an article he is writing while another peer made videos into films in iMovie. And this was in the first fifteen minutes. Students kept notes in Google Docs while they worked, noting questions and tracking their decisions as they went. Questions arose about using multiple accounts, sharing apps and media downloaded via their personal accounts, and connectivity (which was surprising and is something I still don’t really understand – they were working on the wireless just fine). All students veered between these categories at least a little, but some landed pretty solidly into one category. Surprisingly, I didn’t see a single student who fell into the social networker category alone. The kids who sweated over Facetime and Facebook also were first to arrange their student email accounts and set up Dropbox. Something is happening here and it’s exciting. My first impressions are much more complex than I had anticipated and suggest that we have made the right moves in allowing kids a great deal of flexibility, ownership, and a transparent role in the action research component of the pilot. I think they feel honored and excited to be feeding back information and teaching the teachers. More to come soon!